Click on Launch, then click Short Answer. If they haven't already done so, have your students join the room by entering your Room Name. Enter your question in the text box. This is optional; you can leave the Question field blank and ask your students a question out loud. Next, select the number of responses allowed per student. 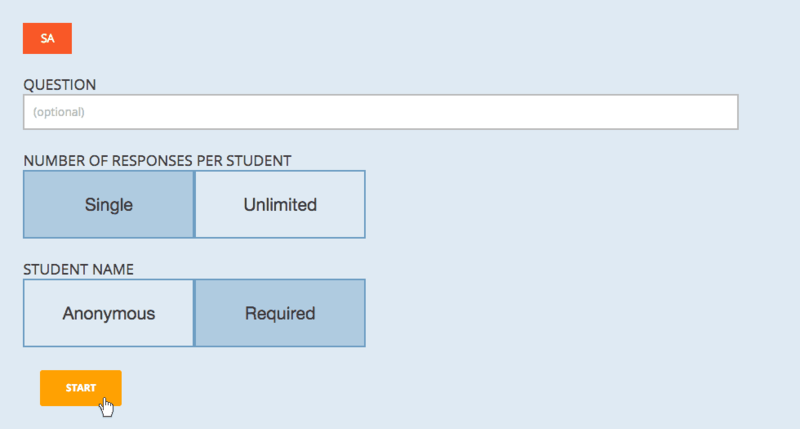 Keeping the Allow Unlimited Responses button toggled off (default) allows only one response per student; toggle the button on to allow students to respond as many times as they want. To allow students to answer anonymously, keep the Require Student Namesbutton toggled off (default); toggle the button on to make students provide their names.Note: If you require names, they will be hidden during Live Results until you decide to Show Names. 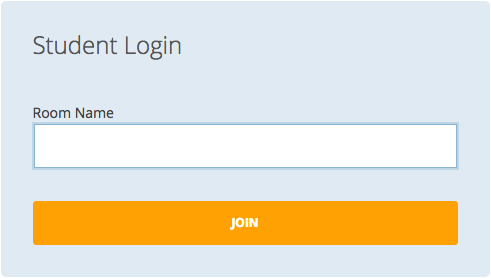 Click Start and a response field (and your question, if you provided one) is sent directly to the students who are logged into your room. 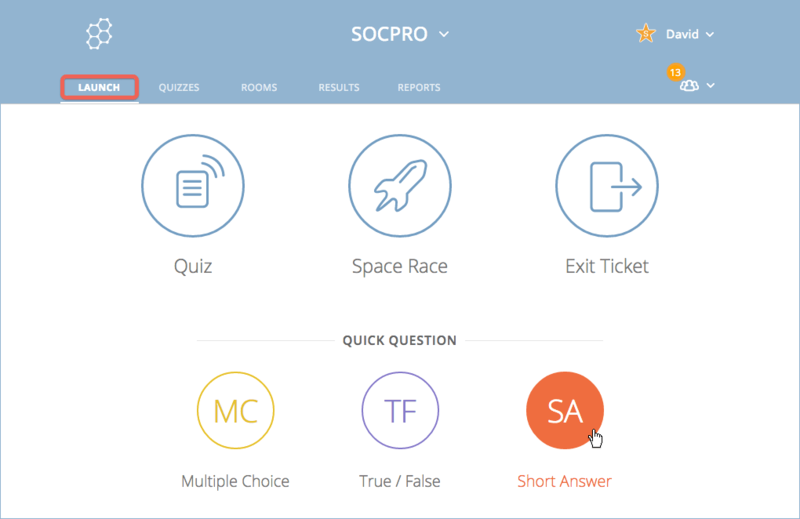 When your students are finished, they click Submit Answer and Live Results are updated on your screen in real time. You can hide a response from Live Results by clicking on Remove to the right of the response. Although they will be hidden on your screen, these responses will still appear in your reports. 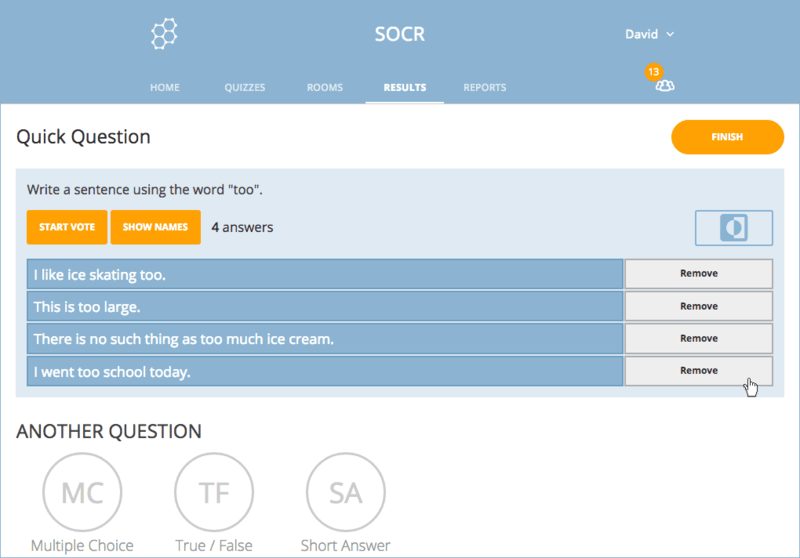 You can also ask students to vote on answers based on whatever criteria you choose (such as the most incorrect response) and see the results on your screen in real time. For information on how to use Start Vote, read our help article, Start a Vote From a Short Answer Quick Question. When you are done with the short answer activity, click Finish; your students can then Log Out or await another question. Note: You can start a new Quick Question directly from Live Results—just click one of the question types in the Another Question section at the bottom of the screen. As you finish, you will be asked if you would like to Get Reports for the current activity or return To Launch. If you choose to Get Reports, you'll be presented with additional report options. 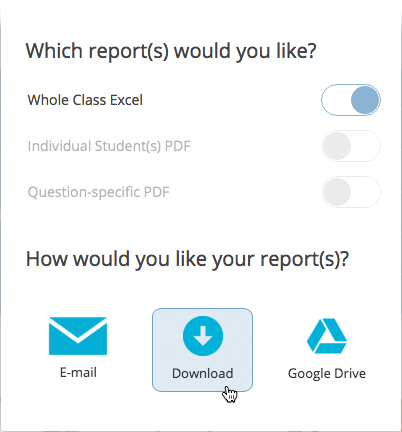 Select the desired report type and then decide how you would like to receive your reports (e.g. Email, Download, or Google Drive). 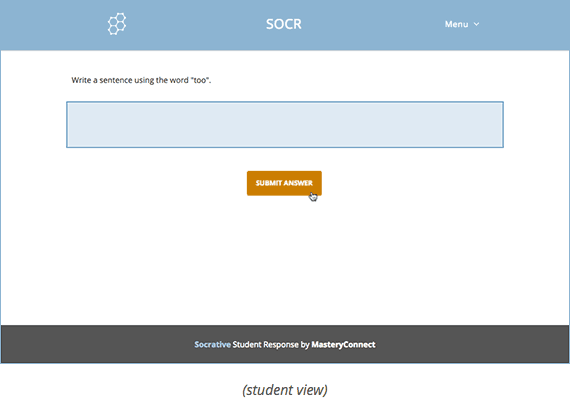 Note: Don't worry if you close the modal, your reports will still be available from Socrative's Reports section.